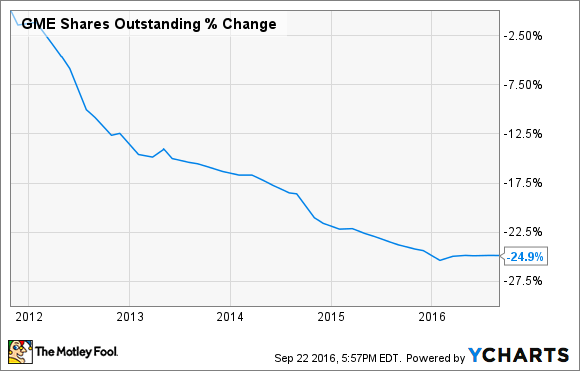 How Safe Is GameStop's 5.3% Dividend Yield? Is GameStop a buying opportunity for dividend investors, or is the business on an irreversible decline? At current prices, GameStop (NYSE:GME) stock is paying a remarkably attractive dividend yield of 5.3%. The business seems financially solid for the time being, but revenue is moving in the wrong direction. This raises an important question: Is GameStop a buying opportunity for dividend investors, or will the company need to cut dividends in the future? The video game industry is going through a major transformation, as many consumers are increasingly buying their video games online and having them downloaded or streamed via the Internet. This trend is getting stronger over time, and it poses a huge challenge for a specialized video game retailer such as GameStop. The company is clearly feeling the pressure: Total revenue declined 7.4% during the second quarter of 2016, while same-store sales contracted 10.6% versus the same quarter in the prior year. For the full year 2016, management is expecting same-store sales to decline by between 4.5% and 1.5% year over year. Revenue in the industry tends to be be quite volatile on a quarter-to-quarter basis, since it fluctuates with new video game and console launches. However, when looking at revenue growth over the last five years, sales are clearly moving in the wrong direction, so GameStop is facing permanent problem as opposed to just a temporary difficulty. This means that time alone won't be enough to cure the company's problems, and management needs to implement the right strategies to first stabilize the business and then jump-start growth. GME Revenue (TTM) data by YCharts. Unfortunately for investors in GameStop, history shows that turnarounds are remarkably difficult, and they fail more often that not. In the words of Warren Buffett: "Should you find yourself in a chronically leaking boat, energy devoted to changing vessels is likely to be more productive than energy devoted to patching leaks". GameStop is not standing still in the face of a changing industry landscape. The company is actively diversifying away from physical games and consoles into areas with more promising prospects. Besides, nearly 33% of the company's revenue is currently coming from second-hand game trade-ins, a business that is quite profitable and more stable than new video game sales. This won't last for ever, of-course, if digital games end up completely replacing physical products, then there will be no market for used video games trade-ins over the long term. Nevertheless, technological change will most likely affect used products at a slower rate than new video game sales. GameStop's "technology brands" division includes businesses such as Simply Mac, a top retailer of Apple products and solutions, ThinkGeek, a retailer specialized in geek-styled clothing and collectibles, and Spring Mobile, which sells AT&T and Cricket products and services. In August, GameStop purchased 507 AT&T Mobility authorized retail stores, consolidating the company as the largest AT&T retailer in the U.S., with a total store base of 1,424 units. When including 72 Simply Mac units and 70 Cricket stores, the total store base for GameStop's technology brands business stands at 1,566 locations. According to management, the technology brands segment is generating a revenue run rate of nearly $1 billion per year outside the company's GameStop-branded stores . In addition, digital sales and collectibles are two strong businesses generating approximately $1 billion each in annual sales inside GameStop-branded locations. These segments should account for a growing share of revenue over time, and this will probably have positive implications in terms of overall company-level revenue growth going forward. Management said in the most recent earnings press release that more than half of the company's operating profit is currently coming from non-physical gaming categories, so diversification efforts seem to be generating results to some degree. Importantly, the segments that are growing have materially higher profit margins than the languishing physical games division, which is helping profitability. Overall gross profit margin was 37.9% of revenue during the second quarter of 2016, a significant increase versus 32.9% of sales in the same quarter last year. 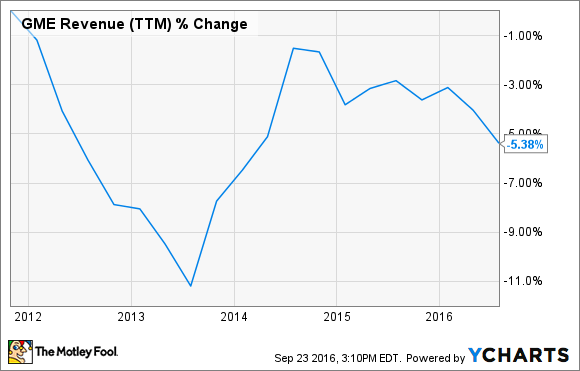 Management is expecting earnings per share during the full year 2016 to be in the range of $3.90 to $4.05. Under such a scenario, the dividend payout ratio would be between 37% and 38% of the company's earnings, quite a safe and sustainable level. Offering a similar perspective, management's guidance is for the company to produce $450 million in free cash flow during fiscal 2016. Stock buybacks should absorb nearly $100 million of that money, while dividends are expected to account for $150 million, or 33% of GameStop's free cash flow. Both earnings and cash flows are enough to cover dividend payments and stock buybacks. Besides, dividends are generally considered a priority over share buybacks for most companies. This means that, even if GameStop faces a contraction in cash flow over the middle term, management will most likely reduce buybacks before cutting dividends. On the other hand, it's important to keep in mind that these figures are based on management guidance, and there is no guarantee that the company will in fact deliver in accordance to such guidance. Revenue during last quarter was significantly worse than expected by management, comparable sales declined almost 11% versus guidance for a decline in the range of 4% to 7%. This shows that investors should take management forecasts with a big grain of salt, especially since the company is operating in an uncertain environment. GameStop has allocated nearly $1.2 billion to stock buybacks from 2012 to 2015, and the company has reduced the amount of shares outstanding by almost 25% over the past five years. All else the same, the smaller the share count, the higher the dividend per share that GameStop can distribute with the same amount of cash, so stock buybacks increase dividend sustainability over time. GME Shares Outstanding data by YCharts. Make no mistake, when a company is paying a dividend yield above 5% in the current market environment of historically low interest rates, this is reflecting the fact the market considers those dividend payments quite risky. And for solid reasons, GameStop has not proven to investors that it can reverse the declining sales trend at this stage, which is a huge uncertainty factor to keep in mind when analyzing the stock. Turnarounds are seldom easy, especially for a company operating in the challenging retail sector and facing serious difficulties due to changing consumer habits in the gaming industry. On the other hand, recent initiatives at GameStop seem to be generating encouraging results, and the company's dividends are quite sustainable when compared to current earnings and cash-flow generation. As long as there is no big deterioration in the company's financials, there's no reason to expect a dividend cut from GameStop over the middle term.